GAINESVILLE, Fla. – This fall, an unfamiliar coach on the sidelines has aided the Gators – kind of. 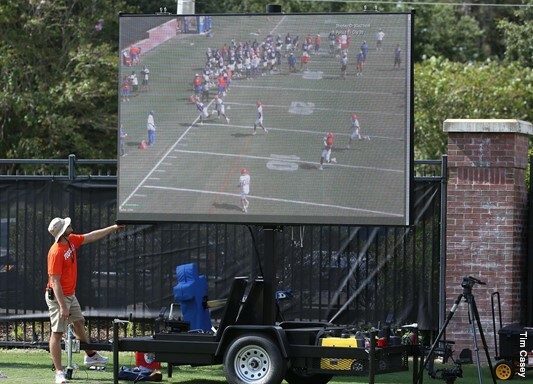 The two trailer-mounted 12' x 7' outdoor rated LED boards give Florida's coaching staff an immediate look at what just happened on the field after a drill or play. In a broad sense, think about the video-replay boards that fans glance at after every play inside Ben Hill Griffin Stadium. "The instant feedback of the Lyvve Coach boards will help a player correct any mistakes he may have previously made," noted UF's Director of Video Services, Reuel Joaquin. "Instead of waiting to get his iPad after practice or for the next position meeting, a player can already see on the field what he needs to do to improve." Manufactured by 8K Solutions in Titusville, Fla., the Lyvve Coach boards are lightweight enough to be pushed anywhere on the field by hand, or towed behind a golf cart. At 5,000 nit brightness, the boards can be viewed perfectly, even in full sunlight.